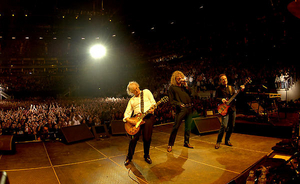 The film, which documents the band's 2007 reunion show at London's O2 Arena, will make its cinema debut at the Ziegfield Theater in New York on October 9 before similar premieres in London, Berlin and Tokyo. Prior to the New York premiere, founding members Robert Plant, Jimmy Page, John Paul Jones will be joined by Jason Bonham, the son of the late Led Zeppelin drummer John Bonham, at a press conference at New York's Museum of Art. Celebration Day will then hold a premiere at London's Hammersmith Apollo on October 12, where Jones, Page and Plant will be in attendance. Events will supsequently be held in Berlin on October 15, which Jones will attend, and Tokyo on October 16, which has confirmed Page in attendance.